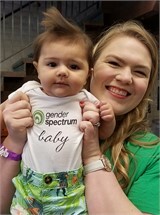 This groundbreaking conference meets the need for information and support for families raising gender non-conforming, gender variant, gender expansive, and transgender children and teens. This is an opportunity for parents, caregivers, and other adults to find strength, support, connections and resources. This includes the Professional Symposiums as well as the Adult Workshops - all three days. Some speakers have requested that their talks not be made available due to the sensitive nature of the content. All sessions available for sale are delivered by US mail on a USB flash drive. Shipping and handling fees will be applied upon checkout. Please allow 10 days to 2 weeks for delivery. Speakers: Jill Jacobs, MS, Shannon Wilber, Esq. Speakers: Diane Ehrensaft, PhD., Asaf Orr, Esq. Speakers: Julia Beers, Pamela Wool, Esq. Parenting Youth on Autism Spectrum & Gender Spectrum: What is the Overlap?